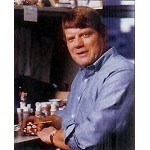 John Collin Francis is a retired artist for Hallmark. John made several of the Child's Ago Collection ornaments. He also the Lighthouse Greetings series and the Madame Alexander ornaments.